The Cobb & Co Hotel St George 399 is done and dusted with 2018 BFGoodrich Australian Off Road Champion Shannon Rentsch claiming victory in sensational fashion. Despite an early challenge from Beau Robinson and Josh Howells, Rentsch cruised to a 12 minute victory over veteran Mark Burrows and young gun Toby Whateley. The victory was his fourth consecutive AORC round win in the past 12 months. 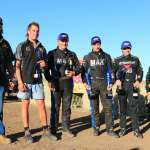 With crews now well and truly on their way back to their homes to begin preparation for the Tatts Finke Desert Race, the official championship points and timings have been released. The competition suffered a mishap in between the second and third sections when a GPS satellite time zone change wreaked havoc to GPS systems across the world, causing the timings to reset and send computers back to the 20th century. However, a slight delay to the start of the third section saw competitors back on track and the timings fixed for the remainder of the competition. Click here to view all section timings and Championship results.